Note: Selecting a Font Family changes the Font list to show fonts in that family. Visit our font details page for samples and example worksheets. This form can be used to create printable Bingo Games. Bingo Games can be created with numbers or shapes, with or without column headings, and in a variety of colors and display formats. Note that only a few style of Bingo Games are available here. An abcteach membership allows you to create any number of Bingo Games from your own lists of words, or from our collection of clip art. Member-created Bingo Games are saved online and can be edited, reprinted, and shared with other members at any time. Learn more about abcteach membership. Customize the worksheet instructions, if desired. Type in any letters or words you would like for column headings. Select a game type: Letters or Numbers. Choose whether you would like the cards to be 3x3 or 5x5. Choose whether the column headings should be used in the cards and call list. If you have chosen to make a bingo game with shapes, choose whether the shapes are color or black and white. Choose a font size, font family, and font for your Bingo Game. Choose a border size for the Bingo cards. Choose a border color for the Bingo cards. Choose a document color for numbers, headings, and the call list. Choose a background color for the Bingo cards. Choose whether cards should be printed in a portrait or landscape orientation. Click 'Check Spelling' to check the spelling in your instructions and column headings. Click on the "Print/Preview your Bingo Game" button. Your Bingo Game will be displayed in a new window. To preview and print your Bingo Game, you must have Adobe Acrobat Reader installed. 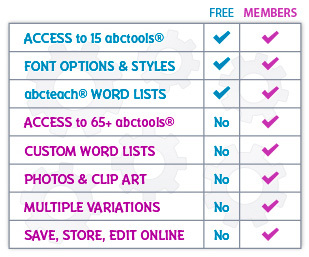 Access all abctools and more!